What memories do you have of this theatre? Theatre is an important part of our heritage. The Pomegranate Theatre is the oldest Civic Theatre in the country. In 2014 it reached a major milestone - 65 years of public service. Since 1949 many professional and local community performers have trodden the boards here. We wish to capture your memories of favourite people, shows and events. Who or what do you remember from the 50s, 60s, 70s, up to the present day? 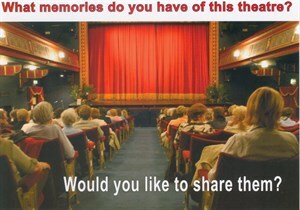 Do your treasured memories come from working at the theatre, performing there, or being a regular in the audience? Is your key memory from front of house, backstage, on the boards, or from writing for or supporting productions? We are interested in all memories from whatever source. Friends of the theatre, both young and more senior, want to come and listen to your stories. We hope to chat to as many people as possible, either individually or in groups. The memories you share could become part of the Pomegranate Theatre Archive. We hope this resource will encourage both young and old to read, listen and look at the development of theatre in Chesterfield and beyond. Do please help us if you can. What and where is "three and a bit" ? Which of the famous Fox dynasty has fond recollections of the Rep?